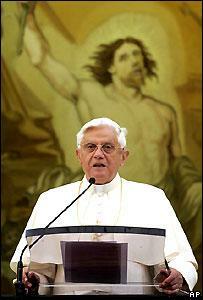 Pope Benedict XVI offered the above quote, expressed six centuries ago by a Byzantine emperor, Manuel II Paleologus, in dialogue with an Iranian scholar, neither endorsing nor condemning it, in his academic speech, "Faith, Reason and the University: Memories and Reflections," delivered in German last week in Germany. It served to introduce his erudite critique of the Western concept of reason since the Enlightenment. These words, spur three reflections. 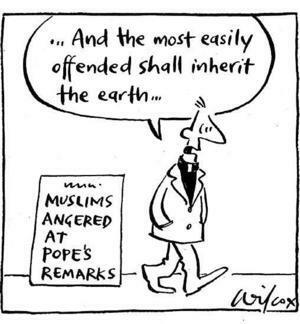 First Benedict has offered elusive comments, brief statements, and now this delphic quotation, but he has not provided a much-needed major statement on this vital topic of Islam. One hopes it is in the offing. 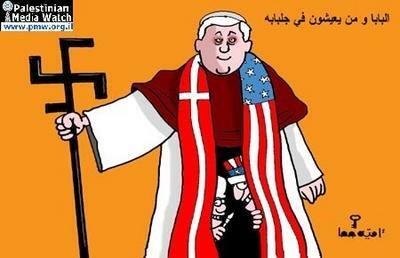 "The Pope and those who live under his cloak," Al-Risala, a Palestinian newspaper, September 18, 2006.